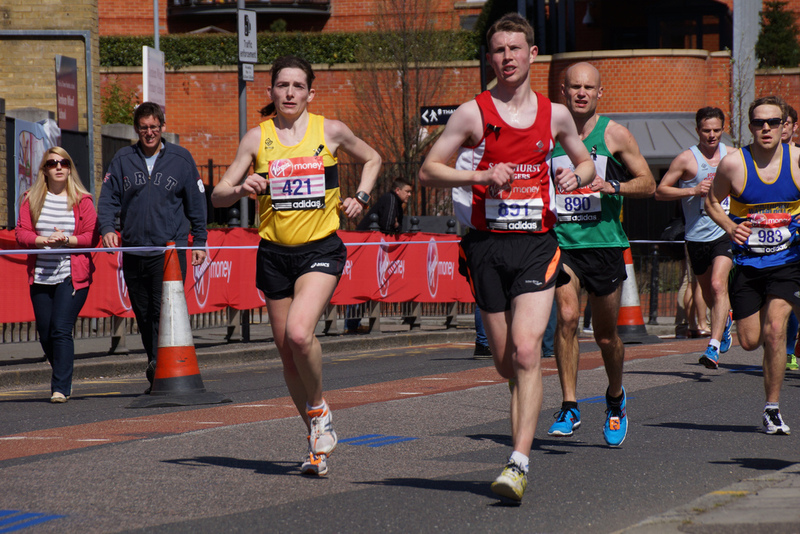 Andrew Brooks – I always enjoy the Fleet Half Marathon so I was quite looking forward to the re-arranged event (full respect to Fleet AC for re-arranging the event). Having already had a couple of respectable races this year over the 13.1 mile distance I wasn’t too worried about my time for this race – I just set myself a target of starting at an easy pace and finishing strong. My race plan almost went wrong when after 2 or 3 miles I was engulfed by the 01:30 pacing group and had to push on to get out of the stampede – I think the 01:30 pacer was trying to kill off his group! The rest of my race felt pretty comfortable and I ran the last 6 miles or so with another friendly runner and we helped push each other along. In the end I was happy with my finishing time (only 25 seconds outside my pb from Wokingham) but more importantly I really enjoyed the race – Fleet is always really well organised, a varied and interesting course with great support and friendly marshals – one of the first races on my lists again for 2019. Phil Guy – Amazing to be rescheduled. Really well organised and very easy to park in Fleet. Crowds are really strong and supportive. Just hate the last mile but the finish in the park is great. Charles St Aubyn – Fleet has strangely become one of my favourite HM’s. I like the military connection. I like running down the High Street with great support, twice. I like the fact that you’re almost halfway round before you really realise it and I like the fact that they have taken out the big hill at the end. I think. Was due to give it a miss this year due to a clash with The Grizzly, but the snow intervened and Becca Taylor kindly sold her unwanted place. Quite clubby, but plenty of enthusuastic first timers. Not too big, nor too small. Some up, but plenty of down. Some straight, but plenty of turns. Suburbs, high street, business park, motorway bridge, countryside, villages and that final mile straight. Variety, we like. Two PB’s and an SB out of 4 runs in 5 years might have something to do with it too. Karen Gill – This was my 3rd time running Fleet. I’m currently training for Edinburgh marathon and this was originally going to be a training run. With the rescheduled date only 4 weeks prior to Edinburgh my plan was to run Fleet then run home to Yateley to make it a long run. However a small knee niggle turned this into a ‘go out and take it easy’. That didn’t happen either! Planning to get round in 9:30/miles mile 1 went to plan, then I got swept away in the moment and fab atmosphere and the next few were quicker. Chatting with my friend, Helen, the miles crept past and we were soon heading back into town and towards the finish! A sprint finish and bagged a PB! It was a course PB of 3 minutes on last year and an all time PB of 2 minutes! Not bad for someone taking it easy! This is a fab race, great atmosphere and support! Mike Guess – With regular shouts of “come on Mike”, “go Mike”, “ not far now Mike”, I thought there was an amazing amount of supporters out that seem to know me. Then I realised that (with chip timing” everyone’s name now shows prominently on the race number – so I was not quite as popular as I thought I was! The great feeling of coming down Fleet High Street (twice) with large numbers of people cheering. But having to be careful with pace, because no one wants to look like a “ bag of washing” and it’s easy to sub consciously up the pace to look good – with most of the miles still to do ! Trying to hang on to club mate Charlie St Aubyn and seeing him drifting away into the distance – on his way to a pb. Seeing how happy Jim Laidlaw’s mate was after Jim had paced him to a massive pb. Seeing how happy Lucy Dean was on completion of her first half marathon. Jackie Brighton – Last time I ran fleet half was 2006 and hadn’t taken training particularly seriously. Fast forward 12 years, ripe old age of 42 and I was raring to go this year! Very well organised event. Loved the course, especially hitting the high street twice (that had changed to 12 years ago) and well supported along the course made it a great event for me. I was fortunate to get a PB having improved on wokingham and Farnborough this year. Bracknell is next. Heidi Zymela – I couldn’t fault Fleet Half this year: – Great course – last year I thought the persistent (albeit gentle) hills didn’t give enough recovery time, but not an issue this year. Just my lack of long distance training slowing me down for the last 4k. – Loved getting a finishers towel instead of a T-Shirt! What a great idea! – Great having our names so big on our race bibs; there’s definitely something motivating when strangers shout your name! – So much enthusiasm from the spectators and the marshals! Overall, it was a great day, definitely made the date delay worth the wait! Jim Laidlaw – As per normal the bag drop was easy, due to the rearranged date the numbers had decreased, this meant no queues for the loos!! A decent medal and goodie bag. This year the final 400 m felt a lot shorter maybe due to my easy paced run rather than the full pelt . A enjoyable run. Jane Bannister – This was my first time at Fleet Half Marathon and I only entered because of the change in date and nothing else going on. I really enjoyed the whole event, it was nice and local with 10:30am start so need to get up early and I managed to park nearby so not far to walk to the start. The bag drop off was easy and more importantly there were plenty of toilets so no queuing. It was great seeing friendly SJ faces before we set off for a quick catch up. There were pacers if you wanted one and before I knew it we were ready for the off. There were lots of supporters out on the route and I enjoyed the course – even running down the high street for a second time. Lovely goody bag and medal. I even managed to get a massage afterwards. I would definitely do this race again and it’s definitely a PB course – so well done all the SJ’s they got one – there are too many to list them all! although not for this time which is another reason to go back. Ian Watson – For me, I had not set out at all to get a good time but to my surprise I got one – at 1:41 my second best HM and not far off my 7yr-old PB. Though of course that made me happy, the day was truly not about that; it was about a great running experience which reminded me of why I run, why I enter events, what a great community runners and supporters are, and how lucky I am to be part of a club to share it all with.If you are considering doing a Half Marathon, possibly your first, this is one I would definitely recommend. The time of year, modest entry fee, relaxed atmosphere, great support from inside the club and out, flat course and short journey time make it very hard to beat. Lucy Dean – It was a wonderful race. The support from the people of Fleet and the surrounding areas was amazing. I had my very own cheer squad towards the end of the race. I met a complete stranger during my run who ran alongside me and cheered me to the finish line!! His name was Nathan and he’s in the Army. Fern Stonestreet, Ian Bromley and Ray Hale as spectators cheered me to the end. Everyone was really supportive on route which made it so much easier. It was a really well organised race as you’d expect from the highly experience Fleet Half organisers. I 100% recommend this race if it’s your first half-marathon, like it was for me. It was so good that I’m seriously considering signing up to do more of these events. Lauren Askew – If anyone had told me a year ago when I joined Sandhurst Joggers, that right now I’d be 2 stone lighter and 4 months into my #twelvehalvesintwelvemonths personal goal, I’d never have believed them… but here I am. With a PB and that elusive sub 2 hour half under my belt to boot courtesy of Fleet Half Marathon last Sunday! Having set myself the goal of running a half marathon a month all year and being booked up from January to June, it didn’t start well! Both January and March’s events were cancelled due to adverse weather conditions which left me running those 13.1 miles tagged onto a club run in January and onto the SJ Canal Run in March. In April I ran The Magna Carta which I didn’t particularly enjoy so I was pleased to get a second shot at April with the rescheduled Fleet Half. I turned up alone but within minutes was surrounded by a sea of red and white t-shirts and vests and started to feel more relaxed around my fellow SJ’s. What a superb event Fleet Half Marathon is! The organisation, the course, the support, the facilities. Just brilliant. And the weather was perfect. I bumped into a work colleague with whom I ended up running the whole route with. The first 5 miles seemed to fly (run?) by with the cheering crowds a real boost. At this point I realised I was still with the 2 hour pacer so wondered if I should try to keep up. At mile 9, just as I wondered if I could keep up any longer, our 2 hour pacer started an impromptu rendition of Sweet Caroline which, I thought, if I could sing (read that splutter/gasp!) along to whilst running, then I could probably stop squawking and keep up with the pace for another 4 miles. Which I’m glad to say I did… and a tiny bit on top to get me my new PB of 1.58.26 and my sub 2 hour half. Having crossed the finish line it was great to chat to so many other club members who had also achieved fantastic personal results on the day. All round a fabulous atmosphere to end a great race! I’ll definitely be signing up for 2019.